The show was broadcast live from 6.04–6.30pm from Studio Four in Television House, Kingsway, London. “Today” was a local news programme available to those living in the London area. During the light-hearted interview Lennon and Ono discussed their recent wedding, honeymoon and bed-in. 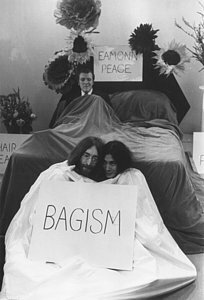 Lennon told Andrews they were “willing to be the world’s clowns” for peace, and conducted the interview from inside a white bag to prove it. I’m not sure about the “light-hearted” part; in the extremely low-quality audio available on YouTube (no video is extant), Andrews is snidely condescending, while members of the audience are downright hostile. (Derek Taylor: “I don’t believe the way they were treated on the Eamonn Andrews Show!”) Apparently the generational divide that had begun to open over the preceding years had now widened into a gulf across which communication was next to impossible. I would like to ask Mr. Lennon… I’m merely asking this because I just want to know… and I’m not trying to be facetious…. Does this all stem from the war in Vietnam? No, no, it’s all forms of violence. The war in Vietnam is a manifestation of the whole of the world’s violence. And I think Hitler and the Germans were not the only ones to blame; I think it’s a manifestation of man’s violence. So if course I’m protesting against Vietnam but also… anywhere else that violence is happening. At this point, perhaps sensing that a serious conversation was about to break out, Andrews put a stop to things. Or maybe they were just out of time… as are we.